This primavera pasta is a weeknight wonder. 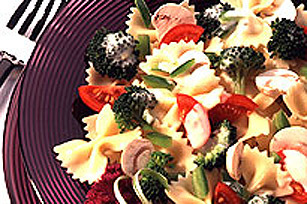 Crisp vegetables, Italian dressing, pasta and Parmesan create a simple pasta dinner with all-family appeal. STIR fry vegetables in dressing until tender. TOSS with pasta and sprinkle with cheese.